Also, this year we have started something new for the dinner's program book (which over 500 people see), and the Cleveland Chapter's website. 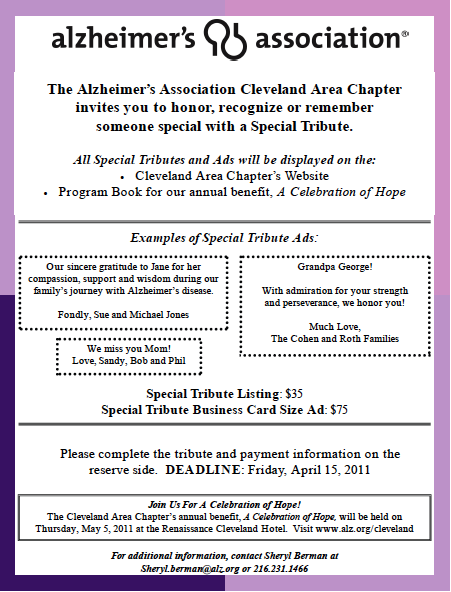 You can purchase a special tribute listing or a business card size tribute to honor your loved one with dementia or to thank a caregiver. These tributes will be posted online and a copy will be sent to you so even if you can't come to the dinner, everyone can see your tribute. This is a great way to honor those living with and caring for this disease, and help raise funds for the Alzheimer's Association. 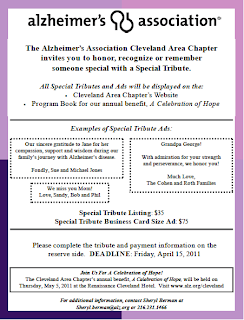 Please go to: http://tinyurl.com/alztribute to purchase your tribute today! I hope to see you at the dinner as well!